Apparently, it’s now Spring, although after a rather snowy March, I am questioning it. March has been a bit of a hit and miss month for me and Toby, and our training. After the first bout of snow, we had no arenas to ride in due to the frozen surfaces, lasting almost a week. I then came down with a cold virus, meaning I wasn’t well enough to ride the following week. So, Toby had a relaxing 2 weeks off (alright for some!). When we finally got around to doing some work we did some Western exercises focusing on flexion. Along with this we worked on making sure Toby was off the forehand with transitions. After so long off, Toby found this all rather exciting to begin with, but I have an exercise for gaining back control. The weather has started to warm up, and now I’m feeling stronger, I’ve slowly brought Toby back into work. Starting him off with some lunging exercises. At first, he was relaxed and did as I asked, walk, jog (trot) and lope (canter). He had a few kicks and bucks, which I don’t mind to start with. It’s almost to be expected on his first day back in work. I tried to evenly work him on both reins. Toby had other ideas. Again, calm and quiet to start, and then he exploded. Trying to find every excuse to spook and run! This is where the exercise of disengaging his hind comes into play. As Toby loped (cantering) around me, head and tail in the air, I brought the circle in smaller and smaller until he had to drop down into a jog. I kept bringing the circle in until all he could do was move his quarters round his front. I made sure he correctly disengaged before sending him back out onto the circle. This resulted in him instantly becoming focused and listening, meaning I got some really good work from him. A day later I got back in the saddle and got back into our training routine. We worked on flexing left and right to start, as I find this is a great warm up. It gets him focusing on my aids and stretches his whole top-line. He wasn’t always very good at this kind of warm up and use to be very stiff when I rode English style. Using pressure with my inside leg on the cinch (girth) area, taking up a light contact with the inside rein and relaxing the contact with the outside one, I would ask for the flexion. As soon as Toby gave me this (becoming light and giving with the inside bend) I would release all pressure. Whilst doing the exercise it is important not to cross the inside rein over the withers. This can be a cue for the horse to start stepping sideways during the flexion. I moved onto some jog work, again asking for some flexion. 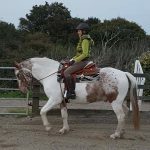 Each time Toby flexed and lowered his frame, I would be sure to remove all pressure, lengthen the rein contact and relax my leg so it hangs down by his sides. He is working in a much lower frame now. Something he often struggled with when ridden English and would at times feel tense and heavy. We practised our downwards transitions jog to walk. We’d eventually work this down towards jog to halt. At the moment, after the halt I instantly ask him to back up a few steps. The reason for this is at times his halt transitions can be a bit vague and aren’t sharp enough. Asking him to back up straight after the halt not only gets him off his forehand and onto his hocks, it also teaches him that after the halt I want something else to happen. Eventually I can remove the back up as the halt transition improves. I finished the session with some lope (canter) work. We have only just started working on our lope, as my instructor has taught me to not move onto the next gait up. Not until your horse is balanced enough in the lower gait first. All we are doing at the moment when loping, is staying on a circle, asking for the lope and then letting Toby find his balance and rhythm. I give him a long rein and do nothing unless he breaks out of lope. I correct him by asking for it again, and then sit and allow him to do it himself. So far, this has had a huge effect on his balance. He can lope for longer without me correcting him, and I am able to steer him around the circle using my body and legs. When I am happy with his performance, I ask him to come straight down into a halt, and then give him his reins and a scratch. This period of “chill-out” is his reward for the lope work. As people will notice, a lot of the equipment Western riders use differs from that of an English rider. One of the most obvious are the Spurs. To most they look big and scary. With their spiky looking wheels and look as though they could do a lot of damage. But actually, used correctly they can be harmless and effective tools. When used correctly, they are a very useful tool, and as with all spurs, they are not to be used as punishment. Although Western spurs look heavy, they are easy to have on your feet. They easily allow the leg to be used without the spur always having to come into play. When using the spurs, you twist your foot out slightly, so the spur comes into contact with the horse’s side. Using an upwards motion with your heel, you roll the rowel up the horse. This movement helps encourage your horse to lift up through their core and lift their back. Allowing them to bring their hocks underneath them more. You should never “jab” the horse’s side with the spurs. If you need a horse to move over or flex, the spur should be used with a continuous light push or pressure on the horse. The moment the horse moves away, you remove your leg from his side. This release of pressure is the horse’s reward for doing it correctly.